I must admit I had never heard of Carson Ellis before I bought the oh so cute Sublime Stitching Pattern designed by her. I love the Russian Bird design and the shirt I embroidered it on is one of my favourites. 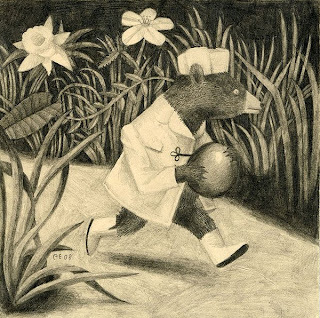 Anyway I found out that Carson does lots of illustrations for the Decemberists (her husbands band, I like their music, bought the cd) and on Flickr I found this lovely work of art ( the bear picture) which I adore. O.k. a totally unrelated afterthought: I came across this story on Craftfail (yep a website for all your failed attempts at crafting)yesterday and I laughed until I cried, it was so funny! Maybe it will make you smile too. ha! it does sound a bit dangerous doesn't it 'I've been carson-ed'. Not everything on Craftfail is hilarious but the sockfrog is a classic.